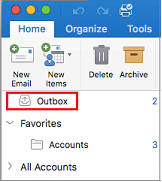 Where's my Outbox in Outlook for Mac? When you're online and email works normally, you won't see the Outbox. The Outbox appears at the top of the sidebar only when messages are waiting to be sent. Tip: If you don't see the sidebar, click View > Sidebar. If email continues to sit in your Outbox, you might be offline. To check, select the Tools tab, and move the slider to Online. If you change your mind and don't want your message to be sent, you can cancel it while it's still in the inbox. Select the Tools tab, and move the slider to Offline. If items are in the Outbox, you can edit or delete them.